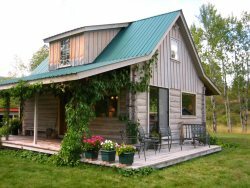 Bootjack Lake Lodge is a rare and unique property, a year-round paradise and the perfect vacation destination for seclusion and fun in Big Sky Country! This private 66 acre estate on a wooded bluff offers a spectacular 55-mile view of pristine, 35 acre Bootjack Lake as well as the mountain ranges beyond. The 4500+ sq. ft. custom log, 4 bedroom, 3.5 bath lodge is bordered by thousands of Flathead National Forest acres and 4200 ft of private lake frontage. Be ready for Trophy Trout Fishing, Kayaking, Canoeing and SUP's, picnic and swimming! The main floor of the lodge consists of a formal dining room, great room with massive rock fireplace, a large kitchen with modern appliances, a half bath, and family room with entertainment center (big screen satellite television, DVD, stereo). Sleeps 10 with the pull out sofa. 4 bedroom, 3½ bathrooms 1 king, 2 queens, 1 full, and pull of sofa. Upstairs is the spacious master king bedroom with a view for miles and a bath with separate shower and whirlpool tub. Downstairs is another television area complete with fireplace. The other three bedrooms are also downstairs, one of which is en-suite with the bathroom including claw foot tub. The other two bedrooms share a bathroom with a wonderful steam shower. The lodge is furnished with big, comfortable furniture and is nicely air-conditioned in summer. The lodge offers great views, with the town of Whitefish is just beyond - 26 miles from the property. Ski at Whitefish Mountain Resort - only a lovely 18 mile drive from the lodge, with magnificent Glacier National Park a short 37-mile day trip. After an adventurous day, sit in the hot tub on the deck overlooking the lake and mountains or sit in the swing at the top of the bluff is a great place to sit, read and enjoy the view, or simply just listen to the loons in the evening. You will find what you are seeking at Bootjack Lake Lodge, whether it is excitement or serenity. Also, use of the owner's canoe is available for guest enjoyment! Please note, this property is on it's own large acreage and you get there by driving on unpaved road for about 2.8 miles. It is highly recommended that you have 4-wheel drive in the winter months. The experience was great. All of our questions were answered accurately and immediately. Amanda was so kind and helpful. Peter was quick to respond to one small problem we had. Can't think of a single thing I would change or improve, with the possible exception of the stove. We all had a little difficulty adjusting to the odd heating pattern of the elements. I expect one could adjust with more than four days. We would love to book a stay in the summer time and do some golfing. Jean was very nice and helpful! Her husband was great helping me with directions to the lodge! The lodge is beautiful and the views are gorgeous and breathtaking. We also loved the fireplaces and the kitchen. When we first arrived a deer greeted us! We loved seeing deer on the property. Once you arrive at the lodge it's so relaxing and peaceful. I don't think we could have asked for anything more in an out of the way home. Everything was spot on. The hot tub was amazing. The location is awesome. I could go on and on. Thanks again. Thank you Jessica for your support. You diligently handled all the arrangements so we could book our visit. If it were my vacation home or even my rental office, I'd hire you instantly! You were so on top of it and I greatly appreciate your service! The beds were wonderful! We all slept great! Very nice! When we arrived at the house the alarm went off and we didn't know the code to stop it. I called the number provided and spoke with Jessica (I think that was her name, sorry if not!) and she talked me through how to stop the alarm. Then she gave me her cell phone number in case anything else came up over our stay. We loved the binders and packets full of information about the property and restaurants, things to do, etc. We especially loved the owner's packet with instructions on how to catch fish in the lake! We followed his directions and caught one that we were proud of. Beautiful home at Bootjack Lake, great views and we had fun on the canoe and fishing. It was a very relaxing vacation!